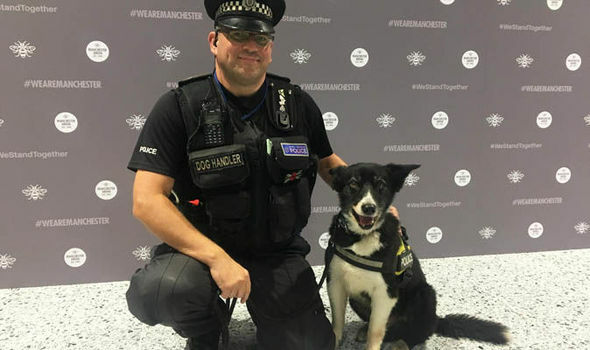 A police dog who was among the first on the scene of the Manchester Arena terrorist attack has retired from the force. Mojo and his handler PC Phil Healy worked through the night after the bombing, which killed 22 people on May 22 last year. The brave collie received the Humanitarian Award at Crufts for his work in the wake of the attack at the Ariana Grande concert. The eight-year-old dog was left mentally scarred by the stress of dealing with the aftermath of the atrocity and started losing his hair. He began suffering from stress-related alopecia shortly after the attack. PC Healy said at the time: “On the night of the arena attack, it was such a long, long day. Mojo did 11 hours of searching there. About a week afterwards, he developed stress-related alopecia. His hair started falling out and we are sure it was brought on by that night. “The dogs pick up on how we feel. Regardless of how much training you do, you are never equipped to walk into what we walked into that night. Mojo, who has worked with British Transport Police for seven years, searching for bombs ahead of royal visits and at the Commonwealth Games, is now teaching puppies Harry and Bennii how to do the job. PC Healy said he is really enjoying his new role as mentor to the pups.